Is the freedom of women and freedom of religion a matter of clash or collaboration? Helen Alvare will argue they are not mutually exclusive concepts and are more relevant than ever, during a talk Tuesday, May 14 at St. Charles Borromeo Seminary’s Vianney Hall, 100 East Wynnewood Road in Wynnewood. Part of Archbishop Charles Chaput’s Year of Faith Lecture Series, Alvare’s talk is expected to reflect the topic for which she has become an expert, according to Meghan Cokeley in the archdiocesan office of Life, Family and Laity, which is sponsoring the series. Cokeley said Alvare is well known for speaking about the Catholic faith and the implications for doing so in public. “Helen’s expertise is that topic but specifically on women’s issues that are in the forefront of the culture — women’s issues and the relationship to religion and religious freedom,” she said. Alvare will address the notion that “religious freedom is conflicting with women’s freedom; that somehow if we as a country are going to affirm religious freedom we are negating women’s freedom,” Cokeley said. Alvare brings to bear a solid background in law and Catholic theology to her arguments concerning religious freedom. 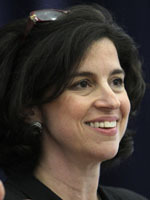 She is a law professor at George Mason University in Arlington, Va., a consultor for the Pontifical Council for the Laity at the Vatican and leads the Conscience Protection Task Force at the Witherspoon Institute in Princeton, N.J.
Cokeley said the talk will be relevant to her personally and likely to many women, but all others as well. “Because of my deep Catholic convictions and my deep convictions about femininity and the great gift of woman for the world, if I can’t reconcile religious belief with my own femininty then I am in trouble,” she said. The current opposition by religious congregations and people of faith over the U.S. Department of Health and Human Services’ mandate for contraceptive coverage in the health care reform law, despite moral objections, has underscored a threat to religious freedom in the United States. Other upcoming lectures in the series will tackle the tensions between science, Catholicism and modern atheism, with Notre Dame University professor Brad Gregory on Sept. 12; and the failures of institutionalized religions in America, with New York Times columnist Ross Douthat on Sept. 19. Archbishop Chaput will cap the Year of Faith series with his talk on the call to conversion and the New Evangelization on Oct. 1. It is not too late to register for the May 14 program, which begins with Alvare’s talk at 7 p.m. and continues with a question-and-answer session until 9, or any talk in the series. Registration is online at the website for the lecture series.